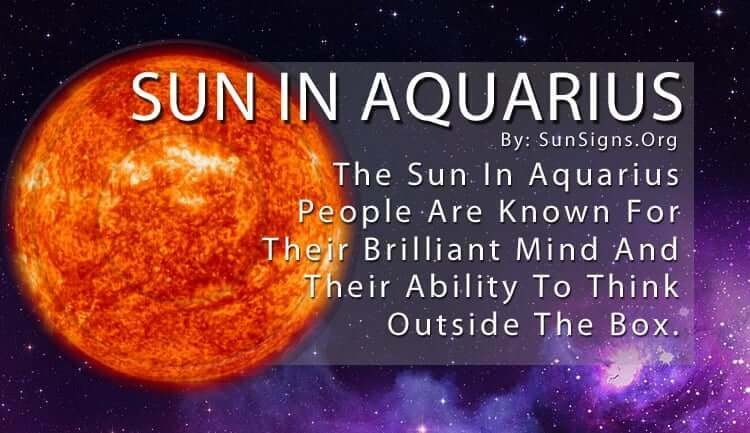 The sun in Aquarius people are people who are unique and different. They believe in helping everyone. The Sun represents innovation in astrology, and no one is more unique than Aquarius. So with the Sun in Aquarius, you can bet it’s nearly impossible to tell what they will do next. Aquarius sun do what they want when they want, and they never apologize for it. Their eccentricity is limitless. And with the Sun in Aquarius, they are pioneers and visionaries of a different scope. They have a way of looking at things that only those of their like can understand. Sometimes, this leaves others very confused. At the same time, though, Aquarians are social creatures. They enjoy a good debate or even just bouncing their ideas off of other people. Sun in Aquarius are known for their brilliant mind and their ability to think outside the box. They often have grand schemes in mind to change the world for the better, and their humanitarian efforts are admirable. They think beyond the possibilities in this realm and try to envision a future they can contribute to positively. The Aquarius sun people like to hang out at big parties or any social gathering with friends, family, and loved ones. They can have an off-beat sense of humor and often surprise people with their goofy antics. They have a fun and quirky worldview that gives them a creative edge on others. This have a “mad scientist” vibe. The Sun in Aquarius are the craziest of them all. The sun in Aquarius people work best alone at first. Their theories are so out there that no one else can comprehend them. But once they step down the unusual thoughts to more viable solutions, they want to share them with the world. And whether the world is ready or not to hear them, they don’t care. What others think is of no consequence to them. This is why some people see Aquarians as too cool or detached to hang out with them. And this can be the case, as they tend to be off in their world, even when surrounded by a crowd. As an air zodiac sign, everything is going on in their mind, and the physical realm is almost non-existent. This includes their feelings as well, for they are more logical than emotional. Their rational approach to everything leaves little room for the kind of mood they or others are in. This is why some people consider them too standoffish or aloof. Once you get to know the Aquarius and the way they think, you will realize they can’t help themselves. And with the Sun in Aquarius, it’s amazing they can even deal with the real world. It’s difficult enough for them to take care of bills and other household responsibilities, for this is boring and does nothing to further the progress of humanity. But add in other trivial details such as planning trips, events and other gatherings and they won’t even bother. Making the project unusual is the only way to involve them. Allow their imagination to run wild, and the Aquarius Sun sign will create the most innovative gathering you’ve ever been to. While it can sometimes be frustrating to communicate with them, they are always entertaining, to say the least.